Unfortunately, because of time constraints, it is not possible for me to answer all personal garden questions. Thank you for the helpful info. on gout weed, which I am presently battling in my garden. I am curious about whether I can rehabilitate the 3 cubic yards of gout weed infested soil I removed by placing it in a raised annual bed with no possibility of escape. If there is no possibility of escape, the plants ought to remain where you put them. Goutweed rarely self-sows. Thank you for your reply, but if I weed it mercilessly as you suggest, will it eventually disappear. And by the way, if you are as fascinated by gout weed as I am, have you noticed that it grows underground until it hits the central region of another plant and then grows up, thus surrounding itself, so to speak, with plant armour? Fascinating, perhaps, but I don’t like goutweed! Where can I mail order morifium garnet mums? I live in New York. That would be Morden Garnet. Honestly, I don’t know. I haven’t been able to find a New York nursery that carries it. Sorry! Thank you so much for the article on hardy chrysanthemums! I worked in a nursery for several years and there is a lot of confusion about these plants; I am near Brandon, MB and even the Morden series is not always hardy here. It’s great to find I have other choices to experiment with. If my Xmas tree has budded and even grown cones, is there a chance it could be replanted. If it’s a cut tree… that would be very unusual. You could always try, but I’ve never heard of such a thing. Conifers just don’t root from old wood. Thank you so much for taking the trouble to share your expertise. As a gardener whose rhubarb fails to fail, despite my consistent neglect, I have been anxious to be able to use the leaves but had been affected by the no-compost myth. Also wondering whether I can line hanging baskets with the leaves? Will they last long enough for the plants to develop nice root systems to hold themselves together? Actually I’m trying it. Also wondering about using the leaves to basket up my dendrobium orchid. Going for that as well. Sorry, those leaves won’t last long in a watered container. Rhubarb leaves decompose very quickly. Same goes for the orchid. You’d need something longer lasting! So learn not to be affected by the no-compost myth and feed them to your compost pile. Best of luck! Understand microclover is invasive and squeezes out weeds and even competes with grass. ? Can you grow wildflowers within an area planted with microclover, or bulbs such as daffodils? It generally mixes with other plants, just like ordinary white clover (of it which it is just a variety) does. Certainly you can grow it with wildflowers and bulbs. Just loved your writing on root competition and dry shade! Was in Quebec in 2014 but live in Canberra, Australia. We have 4 spaces for birch trees – Jacquemontii. I want 2 of the spaces to have multi-stemmed trees. As I’m 76 & time is running out, I was thinking of buying three 2metre birches for each of the multi-stemmed holes. Would that give them faster growth than the 1 metre trees? You could definitely do that. However, their trunks wouldn’t be as close together as in usual clumped birches. Are you sure you can’t find larger specimens of clumped birches locally, perhaps checking with a tree nursery? No, I cannot find clumped/multi-stemmed birches available on any site in Australia. Big market opportunity! I know a sapling can be cut off near ground level… but I should have done that years ago. What is it the Chinese/Japanese say about tree planting? The best time to plant a tree is (10?) years ago. So I will follow the multi plant in the same hole method. Found this clip which is useful, except as the lady is wearing no gloves, she may need another manicure! 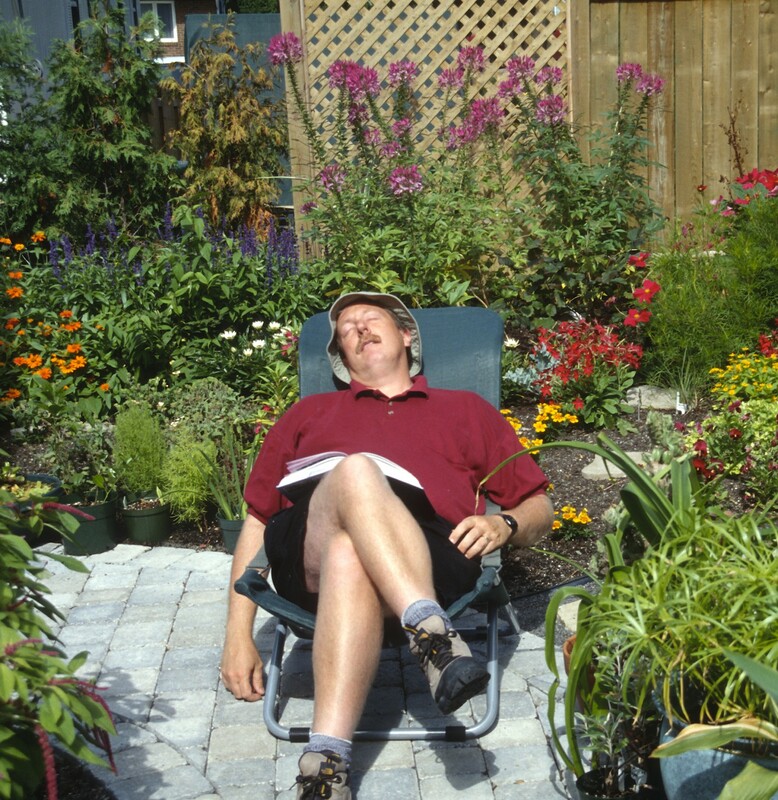 Hi Laidback Gardener, I was perusing the web and found your site, perhaps you could advise me. I’ve have a christmas tree in my garden for the past 34 years, planted on our very first christmas here at my home. however last year I noticed that a sort of bindweed plant had completely taken over the top 5ft of the tree and upon removal of the bindweed the whole section of christmas tree had died. is it best to cut off the dead material in hope of regrowth or is it too late as the tree seems intent on spreading sideways from the lower section. I found your site very informative. I never gave it a second thought about rhubarb, tomato, & potato leaves & stems, never a problem. But I was a little leary about monkshood & foxglove (certainly no seeds from the latter!) Quick question– what about lupines (no seeds but stems & leaves)? P.S. I live on near the Washington State peninsula close to Vancouver Island. Lupine leaves too can be composted. Hello, how can I sign up to receive blog updates via email? Thank you! You should see a “Follow” button on the bottom right-hand side of the page. You can click that to follow. I was just reading your article about the red ball cactus. I have a number of them with good sized babies. I want to try grafting but I don’t want my plants doomed to an early death on top of a hylocereous plant. I have plenty of babies to work with and would like to try grafting to different varieties of green cactus. Can you recommend some types of green cactus that would be more likely to survive long term. Just about any green desert type cactus would work fine. Usually columnar type cactus are used, like Trichocereus spachianus or one of the Cereus, as you won’t necessarily want the rootstock to be plant that produces a lot of offsets. I can at least try if you send me photo at horticom@horticom.ca. This is not Sedum burrito: its leaves are almost spoon-shaped rather than jellybean like. My guess is that it is a x Sedeveria, that is, a hybrid between a Sedum and a Echeveria, possibly the cultivar ‘Blue Elf’. RIght! Thanks for the help! By the way, can you identify one cactus of mine?